On the recent low drain tide, my husband snow shoed to shore and dug us a nice mess of clams. We are fortunate; most places here are pretty frozen over. Our cove is one of the last to still have open flats. He returned with enough steamers for supper, and a big hod of hen clams. Hen or surf clams are quite large, with a short neck. My Aunt Sharon call them “chowdah” clams, but I don’t recall having really “tasted” them in a chowder. 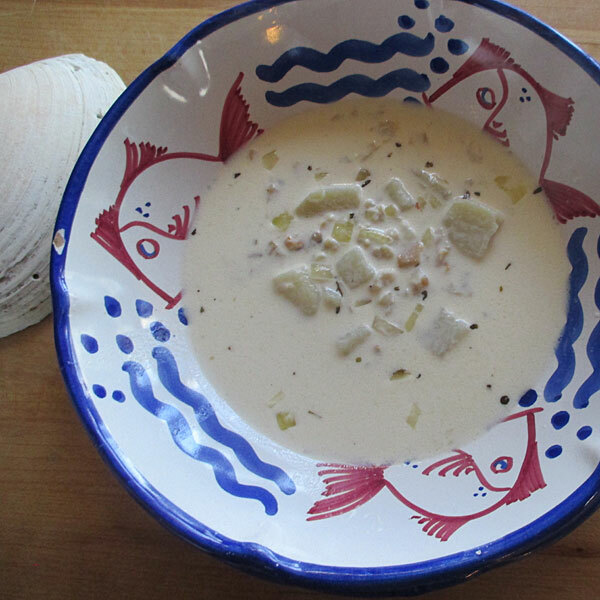 The clam and seafood chowders I’ve made were from leftover shucked steamers. It always puzzled me when folks asked if the clams in my chowder came with the bellies intact? My recipe search for a true “ clam chowdah” first led me to the proper preparation of the surf clam for the stew. The clam is shucked and the belly removed. (Now I understand the belly question). To get nice, evenly sized chowder pieces, (texture is important), the remaining parts are put thru a meat grinder on a coarse setting. No food processors here. Frying up some salt pork or bacon was the source of fat to sauté the onions, and clam juice used to cook the potatoes. A true chowder was never thickened with flour, but from the starch in the potatoes. For those households without the luxury of a dairy cow, canned milk was the norm. My chowder was quite delicious; nice and thick, creamy with lots of clam flavor, perfectly textured potatoes and pretty pink flecks of clams. A true old-time version, which can also be made with canned clams. For purists, Bar Harbor Foods sells “premium hand-shucked, large-cut surf clams” in a can. In a heavy soup pot over medium heat, melt the bacon fat and butter. Add the chopped onion and sauté until transparent. Add the cubed potatoes, bay leaves, and clam juice, simmer, covered, until the potatoes are just fork tender. Stir in the clams and season to taste with the thyme. Add the milk and cream. Bring just to a simmer and season to taste with sea salt and fresh pepper. For best flavor, allow chowder to set overnight (in refrigerator) and reheat gently. 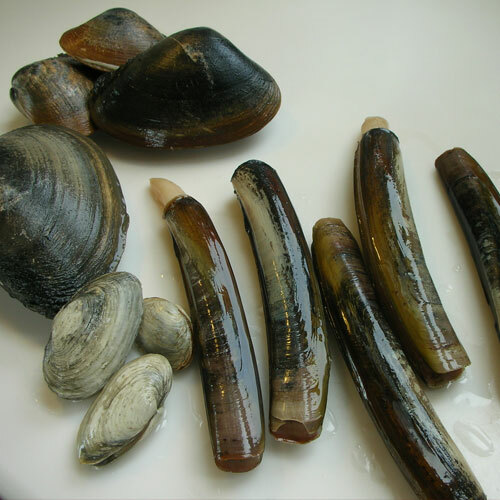 *Hen Clams, also known as Surf Clams, or “Chowdah Clams” are the variety most often used in old-time chowder. You can also use 3 cans (6.5 ounce size) of canned chopped clams.